At the core of ethics in professions is the ability to cope with conflict of interest situations. The professional has a primary duty to look after the interest of the client, and a secondary duty to serve his or her personal interests. The client is normally not in a position to evaluate the quality of the service on offer. Due to the knowledge gap, a lawyer, accountant, consultant, doctor, or teacher can be in a position to give priority to self-interest over the interest of the person who receives the services, without detection. Some professions operate with more or less explicit pledges to the clients not to do exploit their advantage in knowledge: “Trust me; although my own self-interest might dictate other actions, I undertake to serve in your best interest.” A conflict of interest situation is different from a real moral dilemma in that it does not constitute a choice between moral values that are on more or less the same equal footing, but are instead false dilemmas, in the sense of being temptations to choose the morally wrong option at the expense of the morally right one. Send an invoice for the agreed 1,000,000 Euro. Send an invoice for 700,000 Euro. Add extra work useful for the client, so the working hours add up to 1,000,000 Euro, and send an invoice for that amount. When the consulting firm partners heard this story, they stood in the middle of a room, with no furniture. They were told to think individually about the decision for a brief moment, and then decide to move to one of three corners of the room, each representing the three options the project manager faced. The outcome was that all three options received considerable support, as the partners placed themselves evenly in the three available corners. The participants in this exercise had to make a decision without full information about the situation, and the differences in their behavior may be due to variations in how they interpreted it. It is unclear what sort of contract the company had with the client, whether it was a fixed price contract or one where the price would be calculated retrospectively, when the actual number of hours was known. Those who moved to the A corner may have interpreted the situation to be of the former kind, while those who moved to corners B and C may have interpreted it to be of the latter kind. In the ensuing discussion, it became clear that the company could face situations of this nature, where there was ambiguity in the contract and in the expectations from the client. There was also disagreement about how openly they would and should share information about working hours with the client. What should the project manager say to the client if she sent a 1,000,000 Euro invoice and the client later inquired about the number of working hours? One partner claimed that this provided an opportunity to demonstrate client loyalty. A combination of transparency and an invoice for the lowest sum could generate more work for the same client at a later stage. In terms from the Navigation Wheel, it made good economic and reputational sense to share information with the client and invoice for 700,000 Euro. The project manager in the example faces a conflict of interest situation, where she must choose between prioritizing the client’s interest or her company’s interest. As a provider of professional services, the company has a primary duty to look after the client’s interest, and a secondary duty to serve its own interest. Typically, the client will not have the knowledge or insight necessary to judge whether his or her interest is at the forefront when the provider performs its services. It is difficult for a nonprofessional to determine whether an accountant, a lawyer, a teacher, a doctor, or a financial advisor delivers work of the required quality and puts client interest first. Due to the knowledge gap, the professional can often give priority to his or her own interest, without much fear of detection. Nanda (2002) places conflict of interest at the core of ethics in professions, and emphasizes how information asymmetry and knowledge gaps can create temptations to give priority to self-interest over client interest. It is one thing to be transparent and open when the client has the resources critically to evaluate what you are doing, and quite another thing to be so when the client is wholly lacking in professional knowledge. The pattern is present in private as well as public services, and is a pervasive feature whenever someone with a specialized and superior knowledge offers to look after less qualified people’s interests and needs. Some professions operate with more or less explicit pledges to the clients not to do exploit the knowledge gap. “Trust me; although my own self-interest might dictate other actions, I undertake to serve in your best interest.” Doctors and lawyers are among the professions who have institutionalized pledges of this kind. In other professions, there is more of an implicit expectancy that the client gets what he or she needs, and that professional decisions are not dictated by the professional’s self-interest. Accountants are supposed to look after not only their clients’ interest, but also the interest of other stakeholders who depend on correct financial information from the clients. In the Enron case, the accountants in Arthur Andersen assisted their client in hiding financial losses, by using mark-to-market accounting (McLean & Elkind, 2003). By applying this accounting method, Enron could hide losses and appear to be a more profitable company than it actually was. In the aftermath of the collapse of both Enron and its accounting firm, new legislation forced the companies to implement stricter and more reliable accounting practices. What remains unchanged, however, is a system where accountants are supposed to control and be critical of financial information coming from clients who pay their fees to do so. The system can be likened to one where athletes pay their own doping controllers, and have the freedom to sack them and hire new ones if they are not satisfied with the service they get. In sports, a system of this kind would be unacceptable, since it would lead to doubt about the reliability and objectivity of the controls. The doping controllers would be under pressure to look the other way when the athletes were preparing for competition, since they otherwise risked losing their jobs. With the principle of equality in hand, we can challenge the accountants to identify the morally relevant difference between their own relation to clients, and that of doping controllers’ relation to athletes under such a system. If the system is unacceptable in sports, it is equally so in finance, unless there is a morally relevant difference between them. I have yet to hear an adequate explanation of how accounting is different from the hypothetical sports system outlined here. Ethics training with professionals and with students who are preparing to become professionals generally take the form of teaching them ways to analyze moral dilemmas. They become familiar with the Navigation Wheel and other tools to weight and consider the alternatives open to them in a moral dilemma. I contribute to such learning processes, and see the practical use of teaching the participants to think clearly about their options, in the light of ethical concepts and theories. However, the most challenging situations individual professionals or groups of professionals meet may not be ones where it is intellectually hard to identify the right choice. It may instead be situations where they have to recognize and deal with conflicts of interest, as when the client demands that an accountant accepts a dubious form of financial reporting, and threatens to go to another accountant if he does not get his way. These situations are not real moral dilemmas, since they do not constitute a choice between moral values that are more or less on equal footing. Instead, they are false dilemmas, temptations to do wrong rather than right. Smith eventually released a book with his story of why he quit Goldman Sachs (Smith, 2012b) and it generated renewed public skepticism about the handling of conflicts of interest in the financial sector. Smith’s own motivation for going public also came under critical light, as it appeared that he had recently been turned down for promotion and pay raise at the company. Former colleagues claimed that his criticism was unfounded, and that it merely was an expression of frustration over the slowness of his own career movements at the bank. It seemed that he would have been able to tolerate the alleged company culture of ripping off clients, if only his pay and position in the company had been high enough (Schatzker & Ruhle, 2012). Although Smith’s motives for publicly criticizing his former employer can be questioned, he did draw attention to how easy it can be for financial advisors to prioritize self-interest over client interest, without fear of detection. The crucial issue when it comes to conflict of interest, in finance and elsewhere, is incentives. My own impression based on a range of dialogues with financial advisors in Norway is that there is a tension between the official claim that client interests come first, and the practical incentives in the industry. Top management in the banks claim that things have improved after the financial crisis in 2008, and the documentation of sales of dubious financial products to clients. Post-crisis I have had sessions with financial advisors and asked them if they would ever advise someone to make a financial transaction that is best for him or her (the client), and only second best for the financial institution. The question promotes hesitancy and reflection, and I try to be more concrete, by using the example from the first chapter in this book: A client has recently inherited 200,000 Euro from a relative, and comes for financial advice. The considered opinion of the financial advisor is that the smartest thing this person can do is to use the entire sum to reduce her debt. This option generates no income to the financial institution, and not personal bonus to the advisor. The pressure is on to get the client to buy a financial product and it is likely that the advice will be to do just that, particularly if the client is a financial novice and will be unable to evaluate the professional quality of the advice. If top management in professional services organizations really want to signal that client interest comes first, they need to go over incentive systems in detail, and make sure they do not generate temptations to prioritize self-interest over client interest. They also need to demonstrate a willingness in concrete situations to forgo company and personal profits at the expense of what is best for the client. Another option in the financial sector is to change the label on the individuals who are in dialogue with clients about what they ought to do with their money from financial advisor to financial salesperson. That would make it clear to people who turn up to have a conversation about their economy that they cannot expect client-oriented behavior from the person on the other side of the table, but instead a presentation of financial products that person has an interest in selling. I have discussed conflict of interest with a range of professionals, among them dentists. In 2011, the Norwegian Consumer Council cooperated with the Faculty of Odontology at the University of Oslo to test the professional advice given by dentists in the Oslo area (Forbrukerrådet, 2011). Four patients first had their teeth analyzed by professors of odontology, and then went to 20 different dentists (five each) to ask for analysis and a written recommendation for treatment. The results showed considerable differences in the treatment suggested by the dentists. Patients experienced pushy professionals, dentists who wanted to start treatment immediately, even if the problems were of the sort that according to the prior analysis should be treated at a later stage. Dentists failed to distinguish clearly between tooth issues that must, should and could be treated, three categories that the health authorities require dentists to operate with. One of the patients got recommendation from one dentist to nothing with her teeth, and recommendation for treatment costing 3000 Euro from another. Only three of the 20 dentists passed the test of giving adequate recommendations for treatment. In ethics sessions with dentists I have asked them to identify situations where conflict of interest can be a challenge for them (Kvalnes, 2015). One of them answered: “For someone who is good with the hammer, everything looks like a nail.” His point was that a dentist will prefer to use the method he or she prefers, rather than the method best suited to remedy the particular patient’s problem. Dentists in the private sector have economic incentives to change old fillings, and may suggest doing that even in situations where the best thing for the patient is to leave them as they are. Dentists in the public sector do not have incentives to over-treat their patients, but may instead have a personal interest in undertreating a patient. The patient may be uncooperative and difficult, and the dentist can be tempted to say that there is nothing wrong with his or her teeth. Even in this profession, the knowledge gap creates situations where there is a discrepancy between the professional’s interest and the client’s interest, and the former can prioritize as he or she chooses, without being found out by the latter. Theories about human beings, then, can actually have an impact on the object of research. They can become self-fulfilling. Empirical studies show that business-school students do indeed tend to live and decide in accordance with the theory that human beings are self-interest maximizers (Ferraro, Pfeffer, & Sutton, 2005; Gandal, Roccas, Sagiv, & Wrzesniewski, 2005; Molinsky, Grant, & Margolis, 2012). The educational systems need to take this tendency seriously. Ghoshal argues that adding ethics courses to the curriculum is not sufficient, since faculty keeps the Homo Economicus assumption alive in the standards courses in economics. His contribution sparked a debate about the effects of teaching and theory on business-school students (Gapper, 2005; Hambrick, 2005; Kanter, 2005). Here we can add that students who learn that it is always rational to prioritize self-interest will be badly equipped to decide and act responsibly in conflict of interest situations. The behavioral psychologist Dan Ariely tells an interesting personal story about conflict of interest in a public talk on honesty (Ariely, 2012). He was badly burnt in an accident many years ago, and his story about conflict of interest is about what happened when he went to the hospital to see a physician who has treated him over a long period of time. On this visit, the physician introduced him to a new treatment that he thought would be ideal for Ariely. It consisted in using technology to tattoo artificial stubbles on the blank parts of his facial skin, making him look more symmetrical. The physician showed him pictures of two patients who have taken the treatment already, and demonstrated the likeness between the real stubbles and the artificial ones. After careful consideration, Ariely decided not to go for this treatment. His answer provoked a shocking response from the physician, who verbally attacked his patient and tried to instill guilt in him. Ariely could not understand the fierceness of this response. He asked a hospital deputy about it, who explained that the physician was working on an academic paper about the treatment, and urgently needed a third patient to take it in order to make the paper publishable in a prestigious journal. That was his motivation for putting pressure on his asymmetrical patient. Ariely sees this as an example of how an excellent physician and a wonderful human being can become a prisoner of his own conflict of interest, trying to coerce his patient into doing something that is good for physician and not for the patient (Ariely, 2012). A traditional approach to ethics in organizations is that people of weak moral character are the primary cause of misbehavior in the workplace. In the category of moral culprits at work, we find the financial advisor who sells products to a client who would have been better off reducing her debt, the dentists who deliberately either over- or undertreat their patients, and the physician who tries to coerce a patient to tattoo stubble on his cheeks. One view, then, is that these people are morally deviant and weak, lacking the personal moral fiber to withstand temptations. In the next chapter we shall see that this character approach comes under pressure from experimental studies in social psychology and behavioral economics, which indicate that circumstances have at least as much predictive power as character. The people who are guilty of wrongdoing at work can be ordinary leaders and employees, with ordinary moral standards and convictions. Experiments in this research stream give us reasons to doubt that weak moral character is the most plausible explanation to moral misbehavior in organizations. 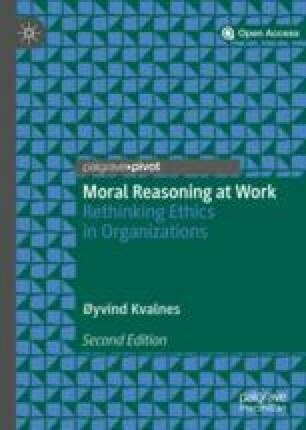 Rather, moral wrongdoing at work is something anyone can become involved in, if they are unfortunate with the circumstances they encounter, and the support, encouragement and critical feedback they get from colleagues in their working environment.